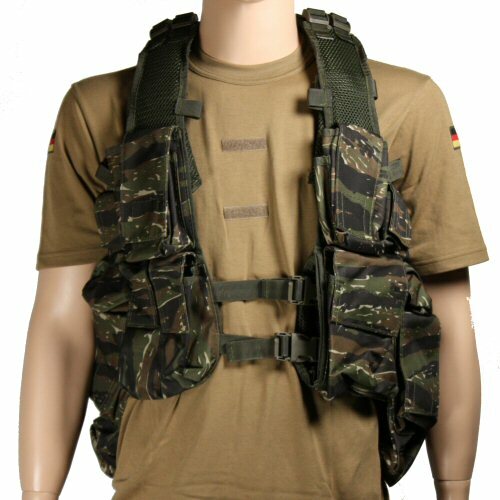 Jungle tigerstripe coloured import version of the popular South African assault vest. Features fully adjustable shoulders and waist, skeleton construction with padded shoulders, back and waist. Internals are constructed with rubberised mesh which adds to the stability of the vest when worn. Pouches are in tigerstripe nylon material, closed with velcro and are sized and designed to support a large variety of field uses from storage of a poncho to spare ammunition, cartridges and magazines. 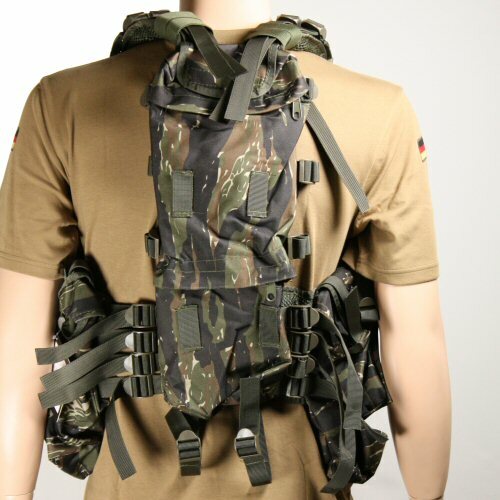 Rear pouch is long and narrow and can be made to take a hydration system. Inexpensive all-in-one which is a great basis for a starter kit.